The passing of Kim Jong-il followed the script of all tyrants who aren’t defeated by war or revolution – a black-clad news reader weeping as she made the announcement that the self-styled “Dear Leader” was dead. There would have been onions at the ready throughout North Korea -if only onions could be had. But in a blighted country whose inhabitants have sometimes had nothing to eat but grass, one supposes that most people have to resort to sticking a sharp finger in the eye to conform with the ritual farce of mourning that will doubtless accompany this otherwise very welcome event. Grubsheet visited North Korea four years ago to film part of a documentary for CNN on Asia Pacific filmmakers. It was one of the strangest experiences of our life, shepherded through selected parts of the country by two strange government guides, who steadfastly parroted the line that everyone was happy and the “Dear Leader” was an awe-inspiring genius loved by each and every citizen. Click here to read some of the more bizarre moments of that trip, including the man with the world’s strangest job – shooing birds away from the statue of the “Dear Leader’s” equally grotesque father, Kim Il-sung, lest the feathered creatures do what most of the country would have liked to have done if they could and crap all over his visage. Life is full of strange coincidences and news of the death of Kim Jong-il came hours after an email exchange Grubsheet had with Peter Hitchens, the prominent conservative British columnist and brother of the late, lamented Christopher. We’d expressed sympathy for Christopher’s death but also recalled the bizarre tour of North Korea we’d shared with Peter over several days in 2007. It was a visit notable for not being allowed any contact whatsoever with ordinary citizens. We were routinely told that “common people” could not be interviewed and there was mild hysteria anytime a member of our party even tried. Yet for all that, it was impossible for our guides to hide the gruesome reality of everyday life under the “Dear Leader”. Taken to a government restaurant in Pyongyang one night, we’d alighted from our tour bus to be confronted all of a sudden by a small group of beggars. Their matted hair and filthy clothes came as a rude shock, not so much to us because we’d all heard the stories, but for our guides, who were gripped with rage and panic and beckoned the ever-present police to remove these offenders, who they described as “anti social elements”. Yeah, right. As we sat down to yet another unpalatable meal prepared by the state chefs, we were able to reflect that at least it was better than grass. IF we’d had the stomach to eat, imagining the fate that must have befallen anyone in North Korea who’d ruined the carefully crafted official script. One day, we were taken on a tour of Pyongyang’s showpiece -its underground railway – marveling at the Soviet-style murals and the passing procession of commuters who looked like they’d emerged from some 1940s communist pastiche – the men in bad suits and the women with bad haircuts in the style of Dorothy Lamour. We tried to engage them with smiles but were inevitably met with blank faces, as if the simple act of acknowledging an outsider was a crime against the state. At one point, we turned a corner and ran into a young boy clearly on his way home from school. There was a instant look of abject terror, a slight freeze and then the boy ran as if for dear life. “Why?”, we asked our guides. “You are westerners. Maybe he is scared of you”. It was the one occasion on which a hint of a smile appeared on the face of one of our minders, a man with the crazed look of a “juche” zealot, the bizarre state religion that worships Kim Il-sung. It’s officially the tenth largest religion in the world, with 19 million supposed adherents. In our email exchange this week, Peter Hitchens and I reflected on the one thing that kept us sane on the bus tour of the world’s last remaining Stalinist dictatorship – two vivacious girls from California whose humour and irreverence constituted perhaps the most potent two finger salute to totalitarianism in any form. These two girls had us in stitches, and our guides looking perplexed, with their imitations of Pyongyang’s baton-wielding traffic cops. And at days end, when the rest of the city was plunged into darkness by the chronic power cuts, they led the boisterous singing around the piano in our hotel’s rooftop bar, our virtual prison for the entire stay. Our guides almost certainly didn’t get it. But this is why America is the real juice in the world as opposed to the juche served up in North Korea. Now, the high priest of Pyongyang is dead. 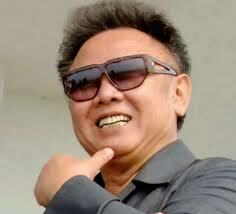 Long live the next -they’ll say – presumably Kim Jong-il’s son, the twenty-something fat boy, Kim Jong-un. It can’t go on forever in the world’s only hereditary dictatorship. But let’s just hope that when the end finally comes – as it must – someone is able to wrest the boy’s finger from North Korea’s nuclear trigger or it’s curtains for the rest of us as well.